Historic Deerfield, Inc., Deerfield, Mass. Fig. 1a: Detail of John Coney Tankard. His words are illustrative of the many functions and importance of silver in early American life. The phrase “handsome cupboard of plate” also aptly describes the American silver collection at Historic Deerfield, the majority of which was purchased and assembled by the museum’s founders Henry and Helen Flynt. Although their primary residence was located in Greenwich, Connecticut, the couple was drawn to the beauty and rich history of the Connecticut River Valley when in 1936 they enrolled their son in Deerfield Academy. Gift of Captain & Mrs. Edgar Miller Williams (69.0126). Fig. 2a: Monogram visible in the detail of the John Allen and John Edwards tablespoon. Fig. 3: Cann, William Simpkins (1704–1780), Boston, Mass., ca. 1740. Gift in Memory of Thomas W. Ashley and Doris H. Ashley, from the Ashley Family of Newton Square, Penn. (96.059.1). What began for the Flynts as an effort to help a private school repair some dilapidated buildings, grew into a lifelong love affair with historic preservation, architecture, decorative arts, and furnishings. Ultimately the Flynts’ interest in Deerfield culminated with the founding of a museum in 1952. Today, Historic Deerfield, comprising eleven historic house museums, is a living history museum dedicated to the heritage and preservation of Deerfield, Massachusetts, and the Connecticut River Valley. With the guidance of curators Kathryn C. Buhler (Museum of Fine Arts, Boston), and John Marshall Phillips (Yale University Art Gallery), the couple assembled a modest American silver collection in order to decorate their restored houses with sympathetic furnishings. 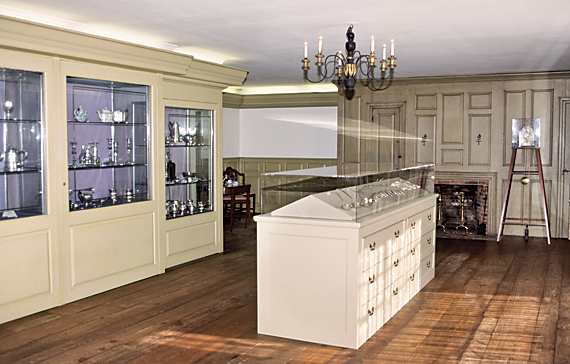 The purchase of the Watson-Crichton Collection in 1954 was a watershed moment for the museum’s silver collection. Victor Watson (1897–1974) was the son-in-law and partner of Lionel Crichton (d. 1938) of Crichton Brothers, dealers in antique silver. In addition to their shop in Old Bond Street, London, Crichton Brothers had operated retail shops in New York City and Chicago from the early teens to the mid-1930s. Lionel Crichton had acquired for his own enjoyment a large collection of American silver—which he once had placed on loan to the Victoria and Albert Museum. The vast majority of the silver was from the eighteenth century, and hailed from Massachusetts, Connecticut, New York, and Philadelphia (Fig. 1).2 In total, the Flynts acquired fifty-two pieces of hollowware and forty pieces of flatware from the Watson-Crichton Collection. The Flynts continued to augment their collection with selective purchases from Stephen Ensko of New York, J. Herbert Gebelein of Boston, Mrs. G. E. P. How of London, Firestone and Parsons of Boston, and Bernard Levy of New York, building a collection that represented all of the major forms made in America, most of the important American silversmiths, and spanned geographical regions from Maine to South Carolina. Stamped “SET” on the knife blades and “Co.” on each knife and fork haft. Silver, pitch, base metal: steel; wood, paper, base metal: brass; textile: red wool baize. Box: 12¼ x 7⅛ x 4¾ inches. Gift of the Nathan Hayward Family (2002.48). Fig. 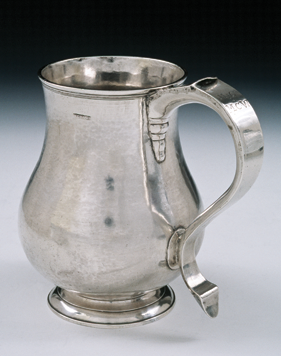 5: Tankard, Paul Revere II (1734–1818), Boston, Mass., 1764. Silver. Overall: 8¾ x 4⅞ inches. Fig. 7: Cann, by Daniel Henchman (1730–1775), Boston, Mass., ca. 1770. Engraved with Lynde coat of arms: three mallets in chief, crest, a griffin holding a mallet, and also later engraved, “John Odin, M. D. / from his Mother, / Obt. Oct. 14th 1847. Aged 71 Years.” (Dr. John Odin’s (1808–1864) great-grandfather was Judge Benjamin Lynde.) Silver. Overall: 5 x 5¼ x 3⅝ inches. Gift of Steve and Ann W. Lord (2012.17). Historic Deerfield, Inc., Deerfield, Mass. Photography by Penny Leveritt. The culmination of Henry Flynt’s research interests and collecting efforts was the publication in 1968 of The Heritage Foundation Collection of Silver, with Biographical Sketches of New England Silversmiths, 1625–1825, co-authored with Martha Gandy Fales.3 Over the subsequent forty-five years since its publication, the Historic Deerfield silver collection has continued to grow and expand—especially in the area of New England silver—through gifts, bequests, and purchases. The high cost of silver objects confined their ownership to a small portion of the colonial American population. While many households might contain one or more silver spoons or small items of silver jewelry, perhaps only five percent of the population owned significant amounts of hollowware. During the first century of settlement, individuals of high social status, such as New England ministers, although perhaps not of great wealth, owned silver in quantities disproportionate to their total estates. Fig. 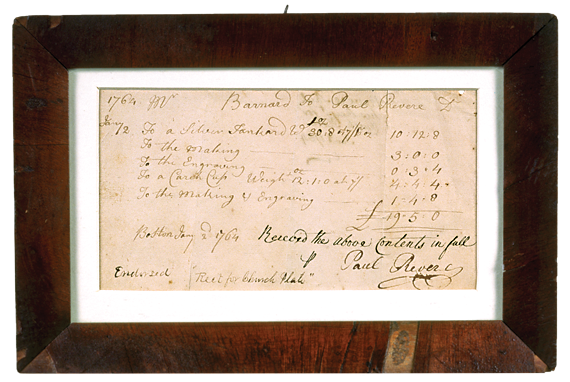 6: Bill of sale, by Paul Revere II (1734–1818), Boston, Mass., 1764. Gift of Mrs. William Howe (77.051). Historic Deerfield, Inc., Deerfield, Mass. Photography by Penny Leveritt. 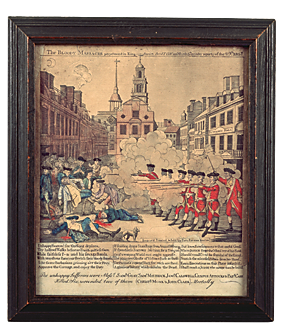 The Bloody Massacre, Boston, Mass., 1770. 10-13⁄16 x 9⅜ inches. (0864). Silver was among the few assets of status and refinement easily divided among heirs, generation after generation. Men usually exercised patronage since they legally owned a wife’s belongings, but widows were sometimes in a position to dispense assets to younger family members. The descent of a cann made by William Simpkins (1704–1780) of Boston, circa 1735–1745, records its significance as a family asset and heirloom (Fig. 3). Engraved on the handle are the initials “M*C/ to/ M.C.W.” below the grip. The initials are those of Mary Jackson Cook (b. 1689) and Mary Cook Williams (1752–1831). Mary Jackson Cook raised her nephew, Dr. Thomas Williams (1718–1775). Mary Cook Williams (known as Polly), Thomas’s daughter, married Dr. Elihu Ashley (1750–1817), son of the Reverend Jonathan Ashley (1712–1780), in 1775. Elihu Ashley studied medicine with Dr. Thomas Williams, leaving to practice in Worthington, Massachusetts, in 1774; he returned to Deerfield when Thomas Williams died in 1775, taking over his office and practice. The home and the office of Dr. Thomas Williams, and the boyhood home of Elihu Ashley, still exist, and both are owned by Historic Deerfield, adding to the context of this cherished object. Fig. 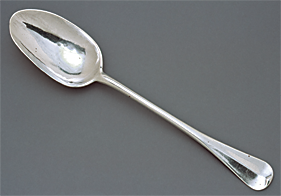 9: Tablespoon, made by Elijah Yeomans (1738–1794), Hadley or Petersham, Mass. ; Hartford or Middletown, Conn., 1771–1794. Silver. Overall: 8 inches. Gift of Carl R. Kossack (1998.7.50). Historic Deerfield, Inc., Deerfield, Mass. Photography by Penny Leveritt. 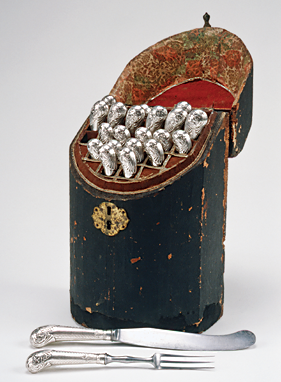 In addition to New England-made silver, the museum owns examples imported from England, including a set of a dozen silver-handled forks and knives, made by Thomas Settle and Co., Sheffield, England, circa 1780–1790 (Fig. 4). This cutlery set, housed within its original faux shagreen box, was owned by the Dwight family of Springfield, Massachusetts, members of a group of leading magistrates, merchants, ministers, doctors, and military officers referred to as the “Mansion People.” The seven interrelated families that comprised this group not only distinguished themselves by their economic prosperity, but also by their aloofness and concern with appearances. An extensive set of silver cutlery like this would have created an elaborate and sophisticated dining display worthy of their standing. Recent acquisitions for the silver collection have focused on objects that illuminate the lives and patronage of local residents. In 1997, Historic Deerfield made a major acquisition, purchasing twelve pieces of church silver from the First Church of Deerfield. These forms attest to the Puritan practice of using domestic vessels in the communion service to express not only their general iconoclasm, but their specific view that communion was a commemorative meal, not a transformation of the wine and bread into the blood and body of Christ. 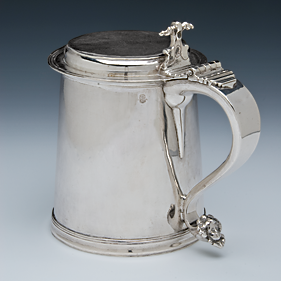 One of the most noteworthy pieces in the group is a 1763 tankard made by Paul Revere II (1734–1818) of Boston. Its engraving reads: “The Gift of /Samuel Barnard Esqr./to the Church of Christ/in Deerfield/1763” (Fig. 5). Samuel Barnard was an active supporter of the First Church. In 1723, he gave funds for the church to purchase a silver beaker made by Samuel Edwards (1705–1762). 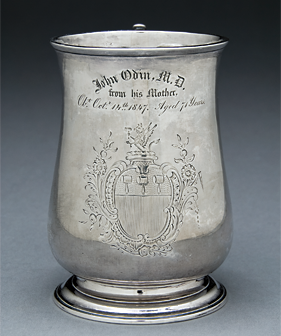 The Paul Revere II tankard was created with funds he gave to the church at his death in 1762. In addition to this object, Historic Deerfield owns the original bill of sale for the piece (Fig. 6). The silver itself cost £10:12:8, while the “making” and “engraving” came to £3 3s. 4d. Fig. 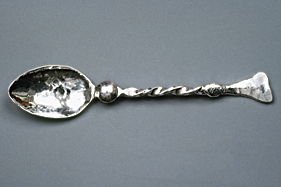 10: Spoon, made by Madeline Yale Wynne (1847–1918), Deerfield, Mass., 1890–1900. Silver. Overall: 5¾ x 1⅛ x 9⁄16 inches. Hall and Kate Peterson Fund for Minor Antiques (89.022). Historic Deerfield, Inc., Deerfield, Mass. Photography by Amanda Merullo. A recent gift to the museum adds another example of the work of a prominent eighteenth-century Boston silversmith to the collection: a cann made by Daniel Henchman (1730–1775) of Boston for Benjamin Lynde Jr. (1700–1781) (Fig. 7). A justice of the Superior Court, Lynde served as one of four judges during the 1770 trials of Captain Thomas Preston and the other British soldiers involved in the Boston Massacre (Fig. 8). Described as a political moderate, Lynde attempted without success to resign his position twice before the trials began. Silversmith Daniel Henchman apprenticed with Boston’s most prominent craftsman, Jacob Hurd (1702–1758), and advantageously joined the Hurd family through marriage to Jacob’s daughter Elizabeth. The cann is further ornamented with the Lynde family coat of arms, likely executed by brother-in-law Nathaniel Hurd (1729–1777). Designs for coats of arms were found in a variety of source books available in Boston, one of the most popular being John Guillim’s Display of Heraldry (6th ed., 1724). 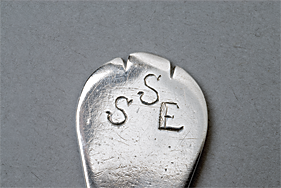 Despite the fact that people in the Connecticut River Valley often expressed a strong preference for silver objects made in Boston, silver production occurred in western New England. But such silversmiths could not sustain a living solely through producing silver objects, therefore many of them developed related skills to supplement their income, such as making watches, clocks, swords, jewelry, and surveying instruments. 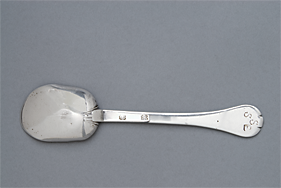 Elijah Yeomans (1738–1794) of Hadley, Massachusetts, and other locations, manufactured silver spoons (Fig. 9), but he also made and repaired clock works, which provided him with a steady income. Henry N. Flynt Silver and Metalware Collection, Historic Deerfield, Inc., Deerfield, Mass. Photography by Penny Leveritt. While colonial American silver forms the strength of the museum’s collections, other eras are also represented. In the 1890s, women in the village of Deerfield seized upon the interest generated by the Arts and Crafts movement to market the traditional crafts of the region. One of the leaders in Deerfield’s Arts and Crafts movement was Madeline Yale Wynne (1847–1918). As a young girl, Wynne learned metalworking techniques from her father, Linus Yale Jr., owner of the Yale Lock Company in Shelburne Falls, Massachusetts. In her artistic career, Wynne created handwork in metal, enamel, and jewelry, as well as painting, woodworking, and basketry. These diverse interests resulted in Wynne becoming an influential and organizing force in the founding of the Chicago Arts and Crafts Society in 1897, the Deerfield Society of Arts and Crafts in 1901, and the Society of Deerfield Industries in 1906. Wynne’s silver spoon has a twisted handle, hammer marks on the oval bowl, and an irregularly finished, broad triangular-shaped handle tip (Fig. 10). Wynne submitted these forms of deliberately unrefined, heavily hammered, and sometimes enameled metalware and jewelry to the 1899 Chicago Arts and Crafts Society exhibition to considerable critical interest. As Historic Deerfield nears the fiftieth anniversary of the publication of The Heritage Foundation Collection of Silver in 2018, plans are taking shape for an exciting year of demonstrations, workshops, lecture programs, and publications that will present new information and learning opportunities about silver in the museum’s collection. 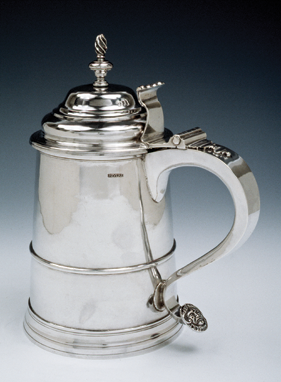 Historic Deerfield’s silver is on display in the Henry N. Flynt Silver and Metalware Collection building (Fig. 11). The eleven historic houses and the Flynt Center of Early New England Life display collections of more than 25,000 decorative art objects made or used in America between 1650 and 1850. The museum is open to the public, five days a week, 9:30 am to 4:30 pm, April 13 through December 30, 2013. The silver collection is also available electronically through the museum’s online database, museums.fivecolleges.edu/. Historic Deerfield welcomes research inquiries. Amanda Lange is curatorial department chair and curator of historic interiors at Historic Deerfield, Deerfield, Massachusetts. 1. Letter from William Fitzhugh to Nicholas Hayward, June 1, 1688, “Letters of William Fitzhugh,” Virginia Magazine of History and Biography, Vol. 2, no. 3 (January 1895), 271. 2. 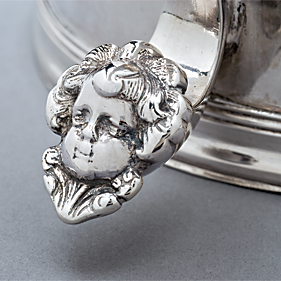 For more information about this acquisition, see Janine E. Skerry, “American Colonial Silver Found in England: The Watson-Crichton Collection at Historic Deerfield,” The International Silver and Jewellery Fair and Seminar Catalogue (London, 1992), 23–30. 3. Although originally founded under the name The Heritage Foundation, in 1971 the institution became known as Historic Deerfield, Inc.
4. Gerald W. R. Ward and William N. Hosley, Jr., eds., The Great River: The Art and Society of the Connecticut River Valley, 1635–1820 (Hartford, CT: Wadsworth Atheneum, 1985), 279.